Nuts come in all different shapes and sizes, but they all have one thing in common: They are good for your health. From peanuts, to walnuts, to even pistachios, nuts contain many benefits to make them ideal snack food. Ditch that bag of potato chips! One nut in particular is constantly praised for its health benefits, that being the almond. We all love the ones covered in chocolate, of course, but for real almond benefits, eating them plain and unsalted is ideal. Almonds are an easy to pack and carry around with you snack. Better yet, almonds nutrition reveals you don’t have to feel guilty eating them. In one serving of almonds – one ounce or 23 almonds – calories in almonds are 162, 117 of that coming from its fat content. Now before we scare you with the word “fat,” almonds nutrition contains the healthy fat we need and none of that saturated or trans fat which can be bad for us. Almonds are also low in sugar – only one gram – and carbohydrates. Almonds also provide iron, calcium, protein and fiber, making them quite the health nut. It doesn’t end there. Almonds also contain both B and E vitamins, along with copper, magnesium and copper, all of which are essential to good health. So as you can see, almonds nutrition reveals it’s the perfect health snack to enjoy daily. There are about 14 different types of almonds that come from all over the world. The main categories of almonds are those with a soft shell and those with a hard shell. Almonds can also taste sweet or bitter and that determines how they are eaten. For example, sweet almonds are often paired with dried fruit. Although almonds can be found in many parts of Europe, California is a large producer. A unique looking almond is the green almond. Although the flavor is similar, green almonds are softer and contain a more gelatin-type center. Although the whole green almond can be enjoyed, the shell is a bit bitter so many people just stick to the delicious inside. Almonds are quite nutritious and offer many vitamins and minerals, and such almond benefits are bountiful. Here are some of the health benefits you’ll get while snacking on some almonds. For your heart: First and foremost, almond benefits also extend to the heart. Almonds vitamin E, magnesium and antioxidant levels can help boost circulation. And almonds fiber content helps the body to absorb fat – the good kind, that is. A study published in the American Dietetic Association noted that almonds may help to lower. So if you’re thinking of almonds benefits, look no further than improving your heart. For optimal heart benefits from almonds, stick to almonds with the skin. The skin contains flavonoids which boost the antioxidant power of the almonds. For your stomach: Not only will almonds fill you up, but almonds benefits extend to your digestion. Almonds can help with positive gut bacteria leading to better digestion. Better digestion means less constipation, no lingering waste in the body, so you may experience clearer, fresher-looking skin as a result. Almonds also contain fiber which can help keep you regular. For your weight: The older we get, the harder is it to maintain a healthy weight. We can’t seem to exercise as much and just about everything we eat adds on the pounds. Because there are so many health risks linked with being overweight, maintaining a healthy weight is vital and another way that almonds can provide benefits. Protein, fat and fiber are all the key players when it comes to feeling full and satisfied. Because almonds contain all three they are a great snack for keeping us full as well as ensuring we don’t overeat. Almonds on their own are not exactly light on calories, so as long as you’re not exceeding one ounce – or 23 – you’ll still remain in the healthy range. For your blood sugar: If managing those post-meal sugar spikes is difficult, almonds can help. Almonds benefits for blood sugar extend to preventing post-meal sugar spikes. In studies where participants were asked to eat white bread alone, or white bread with almonds, the group who ate the bread with the almonds lessened spikes in their blood sugar. So although almonds can be enjoyed as an in-between meals snack, adding almond butter on some bread with your meal is an easy way to maintain healthy blood sugar levels. As you can see, almonds benefits are quite vast and that’s what makes them such a great daily snack. 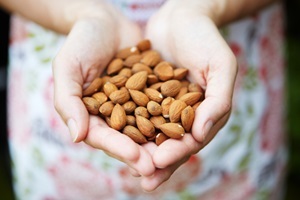 Almonds nutrition reveals that they offer us many of the essential vitamins and minerals we need to remain healthy. And even though the calories in almonds may be high, enjoying them in moderation is enough for you to receive almonds benefits without the added calories. Almonds can be eaten on their own, added to dishes, consumed in almond milk, or spread across some toast. No matter how you enjoy them, just know you’re doing your body good! So the next time you’re on the go and have to grab a snack, we suggest some almonds. Not only will you feel full and satisfied, you’ll be taking in many of the nutrients your body needs to keep going.